Mobile high grade steel TV Cart (STAND-TV03E) from VIVO. Perfect for conference rooms, class rooms, or rolling around your home. 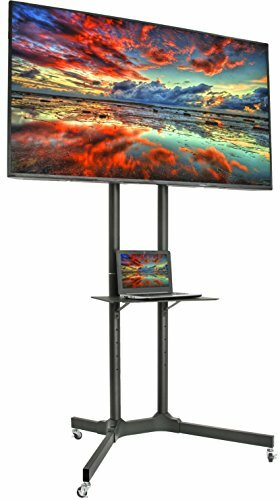 The mounting brackets fit VESA 600×400 and smaller, and is designed to hold screens 30″ to 65″ with a max weight of 110lbs. This solid cart features a clean internal cable management system, 4 locking casters on the wheels to make the cart stationary, and an adjustable front metal shelf holding up to 30lbs. Mounting brackets allow for -15 degree screen tilt to maximize viewing angles. The total cart height reaches 60″ with a base width of 34″. Max TV height is 57.5″ (center) and max shelf height is 27.5″. Stand comes in a smooth black finish. Good looking, strong, well made stand with only a few minor negatives.